Martin Shkreli has been called everything from a boy genius to a vulture. Now he's earned the title "most-hated man in America." The 32-year-old CEO of Turing Pharmaceuticals is at the heart of a controversy this week over alleged "price gouging" by drug makers. Hillary Clinton called out Turing and other drug makers on Twitter for jacking up prices on old drugs. 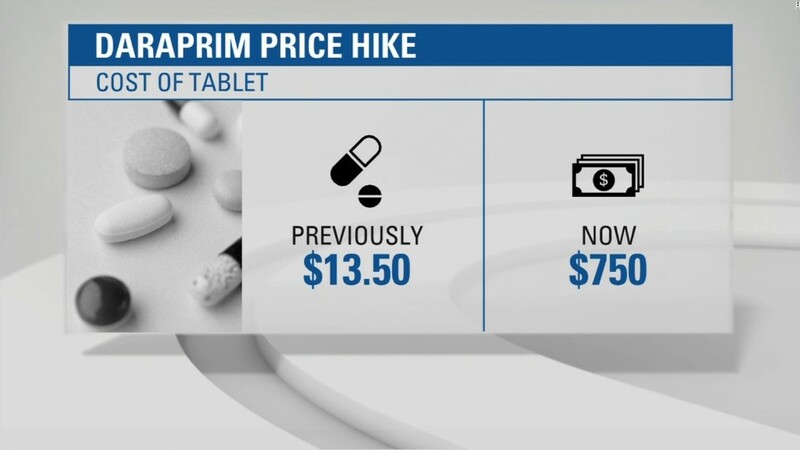 Shkreli's company raised the price on a drug called Daraprim from $13.50 a pill to $750 overnight. The Daily Beast quickly declared Shkreli the "most-hated man" in the United States, surpassing the dentist who killed Cecil the Lion. The drug is used by some AIDS and cancer patients. It's been around for 62 years, but Shkreli's company bought the rights to it from another firm in August. The main use of the drug is to treat life-threatening parasitic infections. On Tuesday night, Shkreli said he had heard the outcry and would lower the price of the drug to something "more affordable." He didn't give an exact figure. Shkreli is controversial. He's a millionaire who has founded several companies since dropping out of high school, but hasn't lasted long at many of them. People who know him say he's incredibly smart, but loves attention and likes to "walk close to the line" between right and wrong. "It seems like the media immediately points a finger at me so I point one back at em, but not the index or pinkie," Shkreli wrote on Twitter with a link to the Eminem song "The way I am." Before founding Turing -- the company currently under fire -- he was CEO of Retrophin (RTRX), a drug company he founded in 2011 and helped lead to be about a $500 million valuation. But Shkreli was fired last year for poor management skills, including his outspoken Twitter use. Retrophin has accused Shkreli of being the "paradigm faithless servant" to use his position as CEO to enrich himself. The company has filed a legal complaint and is seeking $65 million in damages. "I love social media and just being myself," Shkreli told CNNMoney in an interview in March. After all the backlash this week, Shkreli made his Twitter account private Tuesday night. Shkreli doesn't disclose his wealth, but sources estimate it at about $50 million so far. His path to becoming a millionaire began on a chess board in Brooklyn. 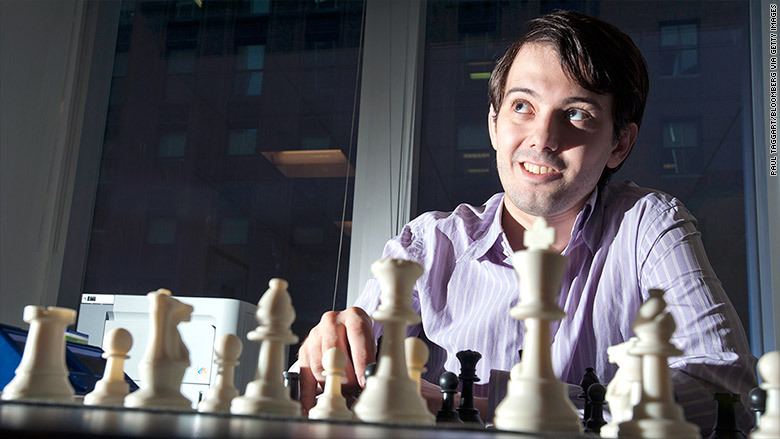 Shkreli's childhood was spent playing chess with an older man named Marty who lived in his building. In between moves, Marty would educate him about stocks, especially biotechs, back in the 1990s. "I kept thinking even as a young kid -- at 10 or 11 years -- I could have a company as big as Eli Lilly or Merck," Shkreli says. Those early discussions led Shkreli to buy shares of Compaq when he was just 12 years old (he still remembers its ticker: CPQ). He followed that by buying Amazon (AMZN) stock shortly after it went public in 1997. "As a kid, my friends knew all the Yankees and Mets players batting averages and how many home runs they hit. I knew everything about all the public companies," he recalls. The child of Albanian immigrants, he credits Hunter College High School as key to his success, even though he never graduated from the school. Earlier this year he donated $1 million to the school-- the largest individual gift in the New York City public school's history. Many alumni at the school are upset about it. "I personally think we should give the money back," says Zack Kolin, a 2006 graduate. "As far as I'm concerned, it's blood money." Shkreli went on to get a business degree from Baruch College (part of the City University of New York). "For me and many entrepreneurs, it goes back to the high school more than the university," he says, calling college a time when he just "went through the motions." Shkreli got his start on Wall Street before shifting gears to starting companies. "If you look at the Forbes list and focus on that kind of stuff, you tend to find out that most people who have made a real fortune have done it by making a company, not by investing," he said. Shkreli spent about a decade working in hedge funds, getting his start as an intern at Jim Cramer's firm at the age of 16. People who knew him in high school say he was captivated by Wall Street and would put in insane hours to learn as much as he could. He then did stints at UBS and Intrepid Capital Management and ultimately opened two hedge funds of his own. He made a name for himself on Wall Street for shorting biotech stocks -- betting that shares would fall after the companies' drugs wouldn't work -- and being very vocal about companies he didn't like on social media. Shkreli tries to cast himself as someone who wants to make a difference, not just make money. "Speculating on stocks is like an incomplete journey in capitalism," he says. People who have known him for years say he has a younger sister with a rare disease, which may have motivated his switch into drug research and production. On Twitter this week, he defended his decision to raise the drug price by over 5,000% saying "I guarantee better access at lower prices to patients than ever." He began to use his mostly self-taught knowledge of drugs to try to develop some of his own. In 2014, Retrophin was granted a patent for a drug that treats PKAN, a relatively rare disorder that causes iron to build up in the brain and slow down or even halt the ability to move. It can be fatal. Shkreli was listed as one of the inventors of the drug. "Health care is complicated. I never studied biology or chemistry, but with a little hard work and the Internet, you can get there," he said. Running a drug company proved a lot harder than shorting stocks for Shkreli and he was ousted from his own company shortly after it went public. He resigned in October 2014 after the company replaced him as CEO. Shares of Retrophin doubled in the months after he left. Now he's back again with Turing Pharmaceuticals. Based in New York's SoHo neighborhood, Turing told CNNMoney it had 35 employees earlier this year. Shkreli said he gives employees free Uber rides and was handing out more stock to employees, since the difference between his wealth being $50 million and $100 million was "de minimis" to him. Shkreli had hoped to take Turing public this year, but that now appears to be up in the air. He also said Twitter "seems to be a great medium for socialist and liberal rage" and declared the Daraprim price hike "a great thing for society." Shares of Retrophin (RTRX), another biotech company Shkreli founded in 2011, have plunged more than 20% since the Clinton tweet about price gouging on Monday. CNN's Dominique Dodley contributed to this article.